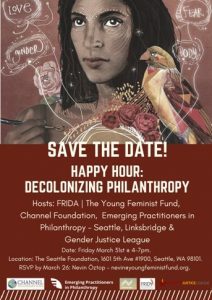 Channel Foundation and grantee partner FRIDA | The Young Feminist Fund, Emerging Practitioners in Philanthropy – Seattle, Linksbridge and Gender Justice League co-hosted a happy hour on Friday, March 31, 2017. Attendees were able to learn about how young feminist organizers are resisting oppression, reclaiming power, and re-imagining philanthropy with FRIDA Founding Board Member Perla Vázquez Diaz and Resource Mobilization Officer Nevin Öztop. The event also highlight opportunities to engage locally with Emerging Practitioners in Philanthropy (EPIP) in Seattle, an intersectional network of changemakers committed to diversity, equity and inclusion in philanthropy. The event featured the poetry of Jéhan Òsanyìn, founding Executive Director of Earthseed, a youth development organization that uses theatre in wild spaces to decolonize those spaces and the bodies that pass through them.